Super Savvy Mommy: Spa Week $50 Gift Card GIVEAWAY!! Spa Week $50 Gift Card GIVEAWAY!! With Valentine’s Day looming overhead, the pressure is on yet again to find the perfect gift for that special someone. Why not give the gift that will keep on giving (without breaking the bank) well beyond February 14th: a ticket to the wonderful wellness lifestyle. There is nothing more romantic then showing a loved one how much you care about his/her overall health and well-being, and that is why Spa Week is rolling out one sweetheart of a sale. From February 1st-17th, consumers can purchase a $100 Spa & Wellness Gift Card by Spa Week® for just $84.99 and also save fifteen percent off all other gift card denominations on SpaWeek.com. 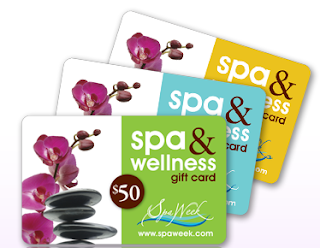 Spa & Wellness Gift Cards by Spa Week® are redeemable 52 weeks a year and are accepted at over 7,500 spas and wellness locations across North America. Best of all, they never expire. Whether you plan to treat your beloved, get pampered as a pair or truly love thyself, there’s nothing like indulging in a well-deserved spa treatment, especially when it’s on sale! Spa Week Media Group, Ltd. is North America's fastest-growing, most respected spa and wellness marketing company. Through its web presence on SpaWeek.com, millions of consumers from coast to coast benefit from an abundance of resources necessary to experience a healthier, well-rounded lifestyle, 365 days a year. Since its inception in 2004, Spa Week has continued to revolutionize the industry with the success of its bi-annual Spring and Fall Events' signature $50 spa services, life-changing promotions and robust gift card program. A true health and wellness finder, Spa Week continues its dedication of delivering the best in health and wellness year round with its Spa & Wellness Gift Card, the premier spa gift card of choice by consumers. Accepted at over 7,500 spas and wellness locations across North America and sold in over 22,000 retail stores nationwide including Target, CVS, Rite Aid, and Sam's Club and on SpaWeek.com, it’s never been more convenient to give and enjoy the gift of wellness. I'd go to Spa 51. I'd use this at All About Me Medical Day Spa in San Diego. The Spa at Floral Valle! Love that place!!! I would be visiting Spa BenMarNicos in Appleton, WI. I'm not sure! There are several that accept the Spa week cards but I've never heard of any of them! I'd use it at Jon Thomas Salon and Spa. I would go to Mario Triccoci in Schaumburg. RELAXATION! I would use this gc at the Mandarin Salon and Day Spa! I would go to the Veranda Pampering salon!!! I LOVE them, and I didn't know that they accepted these gift cards! That's actually great because I can ask for these gift cards for gifts, which is a lot better than asking for money for a bikini wax! Hand & Stone Massage and Facial Spa - St. Petersburg!